Former Under 23 World Champion Anton Cooper scored an impressive top 10 finish in the opening round of the elite UCI Mountain Bike World Cup in the Czech Republic today. The 23-year-old, who had much of his debut season at the elite level wrecked with ill-health, was in outstanding form to sprint home for ninth place in the 129-strong field at a brutal cross-country course at Nove Mesto na Morave, in what was his 23rd World Cup race start across all age categories. In his first World Cup ride for Trek Factory Racing, Cooper managed to escape the opening crash that brought down several riders. Starting on the sixth row, he pushed his way through the field, and edged finally to ninth place in a sprint finish between three of the youngest riders in the race. “I'd rate it as one of the top three results of my career thus far. I’m chuffed,” said Cooper. 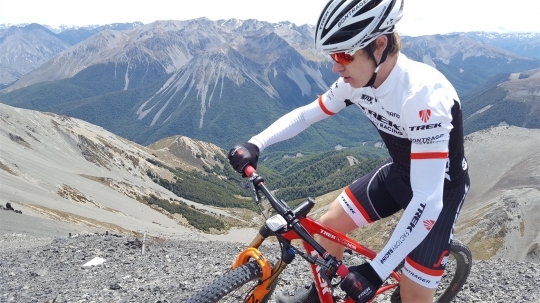 The North Canterbury rider said it was a “brutal but epic day” and his first time testing himself against some of the sport’s best. Cooper showed he was returning to form with emphatic wins for the New Zealand and Oceania titles earlier this year. The World Cup moves to Germany for the second round for cross-country riders this coming weekend.